Glenn Harlan Reynolds is the Beauchamp Brogan Distinguished Professor of Law at the University of Tennessee. He is the author of "An Army of Davids: How Markets and Technology Empower Ordinary People to Beat Big Media, Big Government, and Other Goliaths," and has written for The Atlantic Monthly, The New York Times, Popular Mechanics, Salon, Slate, Forbes, TheWall Street Journal and numerous other publications. Professor Reynolds specializes in law and technology and constitutional law. He has testified before Congressional committees on space law, international trade and domestic terrorism. He has also served as executive chairman of the National Space Society and as a member of theWhite House Advisory Panel on Space Policy. 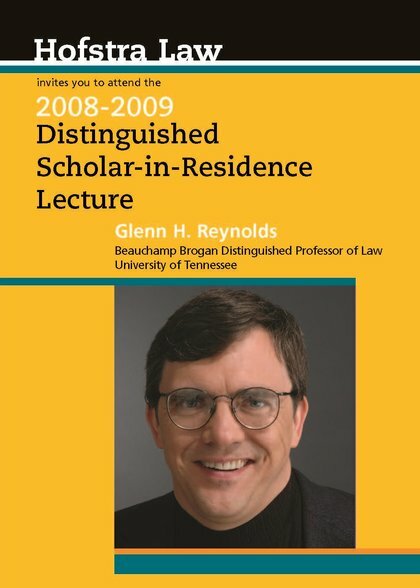 A member of the University of Tennessee faculty since 1989, Professor Reynolds holds a bachelor’s degree from University of Tennessee and a J.D. from Yale Law School. Reynolds, Glenn Harlan, "Small is the New Biglaw: Technology and the Practice of Law (and everything else)" (2009). Distinguished Scholar-In-Residence Lectures. 4.